Not only have I been involved in athletics my whole life but fitness has been a huge part of my professional life. Whether it was wrestling in high school or trucking around gear when I was in the Marine Corp, fitness was always the foundation. I believe that maintaining my fitness level throughout my life has not only just made me feel better physically but mentally as well. One the best parts about being a coach here at Ocean CrossFit is watching and seeing or athletes transform. Whether it's watching someone get their first muscle up or watching someone PR a back squat its simply a great feeling to share the excitement with them. Our members are not just becoming stronger athletes, they are becoming stronger people in general which I feel is the greatest satisfaction for me as a coach. One of my favorite memories growing up was my father who had a barbell with weights in our house and would lift in the living room every time we would watch a Yankee Game together. It was pretty obvious that athletics and fitness was engraved in me from a young age. I played softball throughout my whole life whether it was recreation, school or my traveling team. I loved my traveling team, the Central Jersey Tornado’s, the most because we were a group of likeminded woman from throughout NJ who strived to push ourselves. We would train throughout the year and work with different trainers both on and off the field to get better with endurance, speed and agility. Being in an environment with others who would helped push me really made me always strive to do better every time I stepped on the field. After college my love for fitness continued when I became a personal trainer. I loved working with individuals and groups to motivate and push people to do more than they thought they could themselves. The fact that I made a difference in how they felt about themselves only made me more passionate and wanted to support them more. It was at this point where I was introduced to CrossFit. I loved working out but needed to do something different for myself to be around like minded people who shared that drive to better themselves. When I started CrossFit, like most, I was intimidated. But the community and support that I found at Ocean CrossFit was way more than I ever expected. The coaching helped me do more than I thought I was capable of. Every member supports one another to push themselves day in and out. Every day I surprise myself and cannot believe the improvements and growth I have made. My goal is to help anyone who steps into Ocean to feel comfortable and supported. I want to be there to motivate and push people to help accomplish their goals and feel more confident in and outside the gym. Ever since I can remember I’ve been an athlete. From a young age I was heavily involved in athletics, Baseball, Football, Soccer, Hockey, you name it. This sparked the passion I still carry today which is to push my body to the edge of its capabilities. I was lucky enough to pursue a Professional Surfing career for many years and got to travel the world learning from all different types of people and cultures. It is that which led me to spending my winters in Hawaii where I found CrossFit. I would wake up at 4:00 AM every morning and drive an hour up the mountains on Oahu to the nearest CrossFit Box to train. I had done a lot of training prior, mostly consisted of endurance based stuff (Running and Swimming), but when I found CrossFit I felt something different. I immediately fell in love with the challenge and the community. I started getting more and more involved until CrossFit turned into my main athletic focus. I don’t think some people understand the passion I have for the sport of CrossFit. Daily, I try to one-up the day before and become better every time I walk into the gym. Every day, I learn more and more. I want to pass on the knowledge I have gained through not only my own training, but traveling to different gyms and picking up information off of successful individuals. There’s so much to learn that you can’t ever know it all, that’s what I love about it. I realized the passion I had to help others achieve their goals and become the best they can be when I started coaching at a gym in Costa Mesa, California. I always try to do everything I can to help others optimize performance. Whether that’s nutrition tips, training tips, movement cues, or mental toughness strategies that helped me get to the next level. There’s nothing quite like seeing someone have that “Click” into the community and begin their CrossFit journey, and I love watching it unfold. Unlike most of our coaches at Ocean CrossFit, I was not a life long athlete. Sports weren't a big part of my life. I had brief experiences with some activities, but was largely inactive and was always naturally thin, so it was never something I thought about. It was not until I went away to college and gained 20 pounds that I decided I needed a change. I had heard of CrossFit but never took the initiative to try it. Eventually a gym opened near me and I took my first class... I was hooked ever since. I went from wanting a thigh gap to wanting thick legs so I could squat more. My goals went from being 115 pounds on the scale to deadlifting 300 pounds on a barbell. Thin became a thing of the past... I was more interested in what my body could do than what it looked like. Now, over three years into my journey, I am amazed at the progress I've made and what I've learned. I have never worked so tirelessly for one thing for this long. It has become a true passion of mine, and that is why I started coaching. I want others to see that it is absolutely possible to do what you think you cannot do. I know because I've been there. I want to bring energy to classes and make people enjoy being at the gym. I want them to know that there is a team of people there rooting for them to reach their goals, who will cheer when you succeed and pick you up on the days you fall... and believe me we all have those bad days. They're necessary for success. Coaching brings me a sense of happiness that I can't entirely explain. I am blessed to be able to do something I truly enjoy and to help others fall in love with fitness in the process. When I first started working out, I had absolutely no idea what I was doing. I would walk into the gym, hop on an elliptical, use a few of the machines and leave. I knew that I wanted to be fit and healthy but I just didn’t have any guidance. I think a lot of people can relate to that. I started working for a gym when I started college and there I was able to learn so much from my coworkers. This is when I realized I had a deep and genuine passion for fitness. After training in the gym for a while, I knew I had to switch things up and challenge myself more.  That’s when I found Ocean Crossfit. Training along side such great coaches AND members made me fall in love with fitness all over again. I realized pretty quickly that I wanted to coach others. My goal as a coach is to help guide our members as best I can to reach whatever personal goals they’ve set for themselves. Helping others uncover their potential and seeing them do things they never dreamed of doing is pretty amazing to watch. Adding to the incredibly supportive environment that OCF already has brings me so much joy and I’m so grateful I get to be a part of the team.